While an expansive yard gives plenty of scope for design ideas, you can plan and design a stellar outdoor living area even if your yard is small by using a few design tricks. When you subscribe to OLT you will get the latest offers and discounts available direct from the manufacturer. Your privacy is secure! We will not share your info to anyone and you can unsubscribe at any time. One way to create a sense of spaciousness even if you have a small yard is to carefully locate the outdoor room so that it provides an uninterrupted view. Locate the deck in a place that is not blocked by the fence or house and you will be able to enjoy a sense of space that the outdoors should bring. Another effective way to make the outdoor room feel more spacious is to create different levels. Create a deck with multiple levels in varying shades of the same color to provide both unity and individuality. The only limit is your imagination. Who says you cannot utilize a small yard in this manner? Who says a small yard is boring and lifeless? There are many different directions you can go with a small yard and this is just one of them. You should also consider creating an attractive vista that draws the eye away from the limited space. For instance, you can build a trellis or arbor or place a small waterfall or fountain at the farthest end of the view from your outdoor room. A colorful arbor or a trellis that is covered in vines is a stunning way to draw the eye from the fences around your small yard. You should also aim to keep the space clutter free. This can mean using a few large containers for plants instead of many small ones. You also need to decide on the function of the outdoor room and keep only the essentials, using cleaver storage to keep books, grills, or firewood hidden but close at hand. 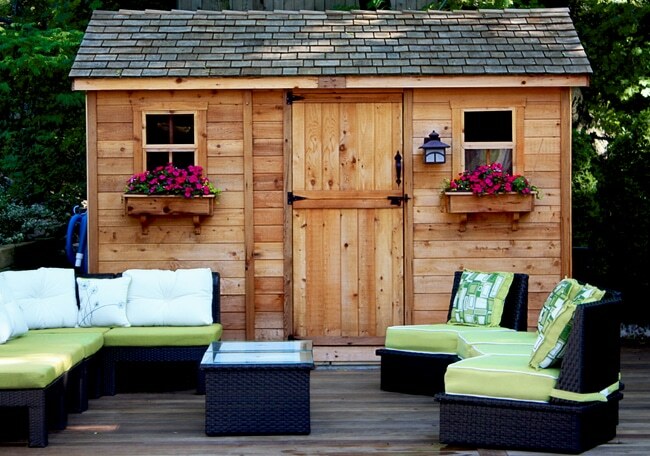 If you plan to use the outdoor room for multiple functions, use multi-functional furniture. For instance, trunks can hold playthings out of sight and also double up as side tables or seating. A short wall can be utilized as a bench while also adding a level to the room, and so on. If your outdoor room is small, but you want to add a few outdoor features, you can consider installing table top features such as a fire bowl or table top fountain. A fire bowl will make the outdoor room feel cozy even if you do not have space for a fire pit and a table top fountain will provide the soothing sound of water without taking up the space of a regular fountain or waterfall. Another way to make the outdoor room in a small yard feel more spacious is by playing with light and color. Stick to a couple of bright colors for furniture and containers for a cheerful outdoor space that does not seem cramped. In the evenings add muted lights from candles and solar lights to create the right ambience for your needs. Instead of putting up a permanent roof or cover over your outdoor room if it is small, you could use retractable awnings or foldable sun umbrellas for shade during the hottest parts of the day. This will enable you to open up the space in the evenings and at night. Just as you would look up for storage space when designing a small indoor room, you should think vertical when designing an outdoor room in a small yard. You can install a vertical garden on one fence or hang colorful lanterns and outdoor lights on a tall tree to make the room feel spacious by drawing the eye upwards. There is plenty of space upward to exploit. Another way to keep the outdoor room from feeling cluttered and confined is by keeping stackable, nested, or foldable furniture at hand. Stools that can be nested will increase seating or double up as side tables, stackable chairs can be spread out as needed, and foldable furniture can be put away when not needed, to open up the space in a small yard. Another way to make the most of a small yard is to use minimalistic furniture. Choose tables and chairs that have sleek lines and are functional. You can also add a hammock or swing in your yard to create an informal nook that can double up as seating if needed. A small yard is no reason to not enjoy the sun and the outdoors. With careful planning and design, you can convert it into an attractive outdoor room that suits your needs. For this, use the same principles you would use when designing a small room and make use of the feeling of openness that a view of the sky and the horizon can provide. Using portable equipment such as grills and barbeques will enable you to host a gathering even in a small outdoor room. to OFFERS, DISCOUNTS & More! Your privacy is secure. We will NEVER share your email and you can unsubscribe at any time.